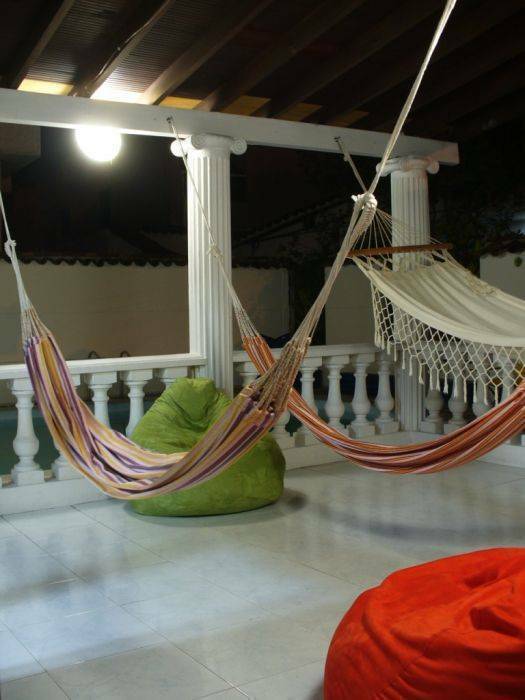 WAYPOINT is a hostel located in Medellin in a quiet neighborhood surrounded by green areas and with all necessary amenities to make of your stay an unforgettable experience. 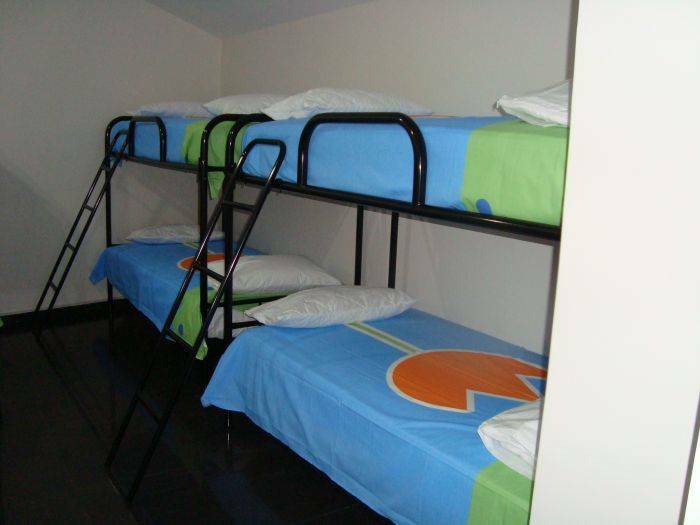 The hostel is in La Aguacatala neighborhood, in a quiet zone of El Poblado, just a block away from EAFIT University, three blocks from the Aguacatala Metro station and two blocks from Avenida Las Vegas, it´s location is unique and close to everything. Our self-catering kitchen is fully equiped with all you need. 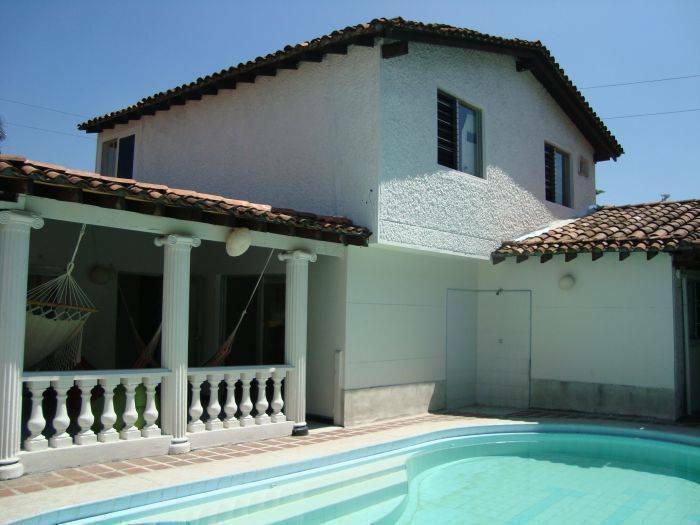 There´s Wi-fi all around the house and desktops to access to the internet. 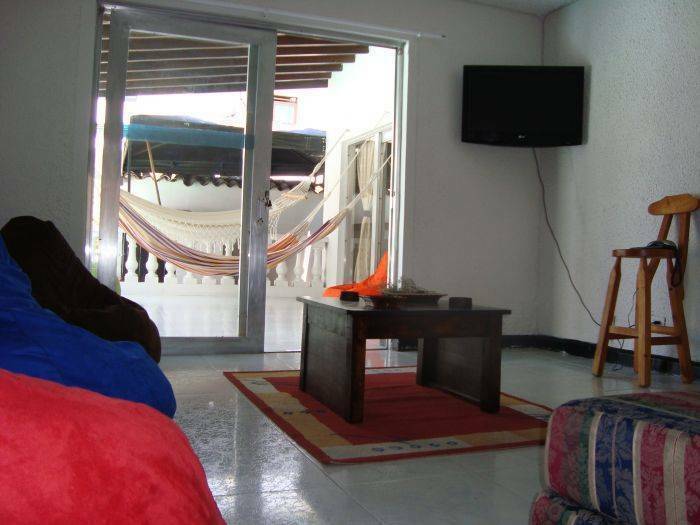 A relaxing TV room with DVD player and comfortable puffs and couch. 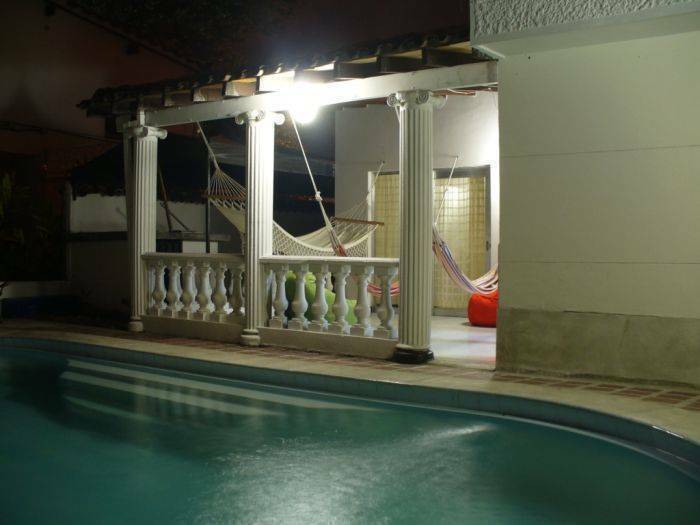 Also we offer a great dinning, BBQ and hammock area nearby our nice refreshing swiming pool, just a perfect alternative according to the weather of the city. 24-hr front desk BBQ area Cooking facilities Desktops Dorms and private rooms Free coffee Gay friendly Hammocks Helpful English speaking staff Hot water Laundry/valet service Library Meeting facilities Multi-lingual staff Open 24 Hours Parking (extra charge) Pool (outdoor) TV room with dvd player and movies catalog The best mattress in Medellín with clean sheets Travel and tourist info WIFI (free) Wi-Fi blankets and towels pillows ¡Swimming pool! 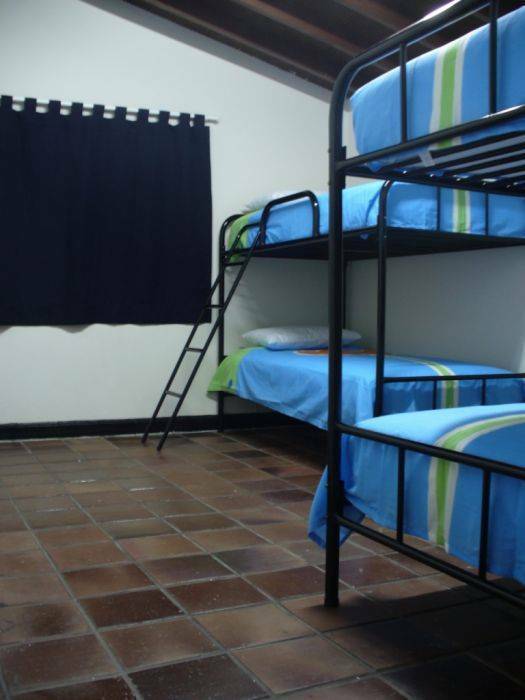 Waypoint is a peacefully Hostel located in a strategic zone in Medellín, you’ll have all the facilities walking around: Big Malls, Cinemas, Universities, Library, Transport, Supermarkets, Nightclubs, and more! Aguacatala Metro Station: just walk three blocks to EAFIT University, take 12th Sur Street towards the glorieta de La Aguacatala, just below it you can find a system of corridors that lead directly to a green area in front of the Carrera 48B, walk right up to the next corner, WAYPOINT is the white house on the right with the logo on the door. Terminal from the north: take the metro at the Caribe Metro Station to Aguacatala Metro Station, Caribe station is near the bus terminal. Once at the Aguacatala Metro Station just walk three blocks to EAFIT University taking the 12 Sur street towards the glorieta de la Aguacatala, just below it you find a system of corridors that lead directly to a green area in front of carrera 48B, continue walking straight to the next corner, WAYPOINT is the white house on the right with the logo on the door. From Caribe station to station Aguacatala is about 25 minutes and has a value of 1, 500 pesos (USD 0. 75). By taxi, tell the driver to take the autopista sur and go to the Aguacatala bridge near the Fábrica de Licores de Antioquia, then tell him to take the Avenida Regional towards north, then take the first entrance on your right (by the corner where there is a public telephone), WAYPOINT is the white house at the next corner to the right with the logo on the door. The journey can take between 30 and 40 minutes and costs approximately 15, 000 pesos (USD 7. 5). South Terminal: you can take a taxi that is parked near the door of domestic arrivals, indicate the driver to take La 80 Avenue, just like he is going to Campos de Paz cemetery, once there tell him to go towards the Aguacatala bridge and take the Avenida Regional towards north, then take the first entrance on your right (by the corner where there is a public telephone), WAYPOINT is the white house at the next corner to the right with logo on the door. The trip can take about 10 minutes and costs about 5, 000 pesos (USD 2. 5). José María Córdova International Airport - Rionegro: there are three ways of public transportation from the Jose Maria Cordova airport and the city Medellin. 1. Taxi: Taxis are lined up at the exit of international arrivals. The journey takes approximately 45 minutes. The average fare is 48, 000 pesos (USD 24). 2. Collective Taxi: Taxis share collective transport with three extra passengers. The cost per person is 11, 000 pesos (USD 5. 5). Usually the waiting time is not very long, the journey takes about 45 minutes to downtown. From downtown you can take a taxi directly to the hostel, the journey can take approximately 20 minutes and costs 7000 pesos (USD 3. 5), taking Avenida Oriental towards the Aguacatala and then take the Avenida Regional to the north of city, then take the first entrance on your right (by the corner where there is a public telephone), WAYPOINT is the white house at the next corner to the right with the logo on the door. 3. Bus: The bus leaves at certain times of the airport. The journey takes approximately 60 minutes to downtown. The average payment is 5, 000 pesos (USD 2. 5). From downtown you can take a taxi directly to the hostel, the journey can take approximately 20 minutes and costs 7000 pesos (USD 3. 5), taking Avenida Oriental towards the Aguacatala and then take the Avenida Regional to the north of city, then take the first entrance on your right (by the corner where there is a public telephone), WAYPOINT is the white house at the next corner to the right with the logo on the door. Local Airport Enrique Olaya Herrera - Medellín: you can take a taxi that is parked in the exit of domestic flights arrivals, indicate the driver to take La 80 Avenue, just like he is going to Campos de Paz cemetery, once there tell him to go towards the Aguacatala bridge and take the Avenida Regional towards north, then take the first entrance on your right (by the corner where there is a public telephone), WAYPOINT is the white house at the next corner to the right with logo on the door. The trip can take about 10 minutes and costs about 5, 000 pesos (USD 2. 5).